The CH1000(LT) is built on a powerful microcontroller platform that has at its core is a 32 bit 500 MHz multithreading microprocessor and up to 8 GBs of removable flash based storage. Gone are the inflexible Eprom based memory and the low power 16 bit processors. This combination of processing power and memory storage gives the CH1000(LT) unprecedented flexibility. Simple software changes turn a traditional school intercom system into a corrections system or a mass notification system. Need your systems to work your way? Just call. The CH1000(LT) family of systems can be customized through our application engineering group. The CH1000(LT) delivers better audio clarity and lower energy consumption due to its class D amplifier. The built in Digital Signal Processor (DSP) eliminates noise and improves voice intelligibility in acoustically-unfriendly environments. Any PBX iPBX telephone system can be integrated with the CH1000(LT) to allow access to paging and any other functions from facility telephone or cell phones. The CareHawk CH1000(LT) uses a distributed cabling architecture that reduces the cable requirements by 2/3rds. For example, 256 audio points only need eight “home run” cables. In contrast, traditional systems would need 256 cables, that adds up to miles of extra cable and conduit, and thousands of dollars in unnecessary installation labor. The models SS16 and SS32 Security Switching Cards can be mounted up to 2700 feet away from the central cabinet. RJ45 terminations simplify the installation and eliminate the need for complicated 66 block/BIX punch down blocks. Pre-recorded digital audio files can be added to the CH1000(LT) for automated emergency notification, or just for fun things like seasonal tones. 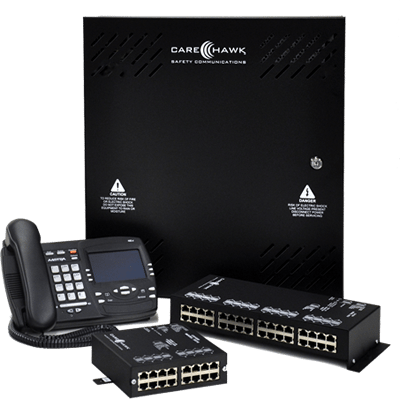 Control the system using CareHawk Assistant PC based software. Assistant provides graphical control and much greater system information to users. Any PC or a touch screen can be used with Assistant. The CH1000(LT) supports the addition of security devices and surveillance cameras on the same cable platform. Cameras can be triggered on motion or a schedule. Motion sensors or door contacts can monitor “out of bounds” areas during core facility hours when the traditional alarm system is turned off. A door station with a camera and speaker provide secured door phone functions. Access control system integration can connect cameras and pre-recorded warning messages to warn people away from off limits doors or alert staff of people entering. The CH1000LT series gives you all the features of a full CH1000 but at a lower cost for smaller facility needs up to 64 audio points. The CH1000 series is designed to grow to 256 audio points and can be networked with up to 7 other systems to a maximum of 2048 audio points. The CH1000 supports CAT5, CAT3, twisted pair, shielded or unshielded, fibre optic cable environments.